Kia has announced that the 2012 Rio sedan will start from $14,150, which buys a Rio LX with a six-speed manual transmission, while upgrading to an LX with a six-speed automatic transmission bumps it up to $15,210. For those who want a little more, top-trim Rio SX sedan starts at $18,210. Just like its 5-door counterpart, all Rio sedans are equipped with a direct-injected 1.6-liter inline-four engine, which is rated at 138 hp and 123 lb-ft of torque. The car returns 30/40 mpg (city/highway) for both the manual and automatic transmissions, and from early 2012, the Rio sedan will be the first non-hybrid or luxury vehicle available with Idle Stop and Go (ISG) technology. This tech helps further reduce fuel consumption when the car is stopped by shutting the engine off, and turning back on once the brake pedal is released. All trims (LX, EX, SX) come standard with air conditioning, USB and auxiliary jacks, 15-inch wheels, and hill-start assist. Opting for the SX trim level gets you 17-inch wheels, fog lamps, LED headlights and taillights, power folding outside mirrors, rear back up camera, and Kia’s UVO voice-activated infotainment system. 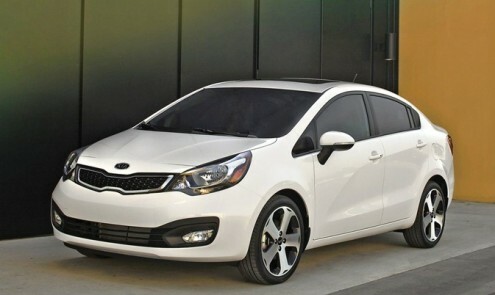 For comparison, the Rio 5-door starts from $14,350, which is just a $200 price bump compared to the sedan. The SX hatchback commands $18750, which is $500 more. Being made up of 85 percent recyclable materials, the Rio (sedan or 5-door) is a good way to go green without spending a lot of green.